Less than a week remains for registered voters in Texas County to apply for absentee ballots to be mailed to them for the July 27th Primary Election, County Election Board Secretary Kimberly Sloat said today. Applications for absentee ballots must be in the hands of the County Election Board no later than 5 p.m. on Wednesday, July 21st to be processed. Any registered voter eligible to vote in the election may vote by absentee ballot without stating a reason, Sloat said. Absentee voters may apply in person at the County Election Board office or they may send their applications by mail, by fax, or by telegraph. absentee ballots only by mail, by fax, or by telegraph. only by mail, by fax, or by telegraph. 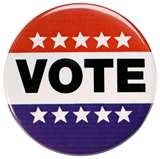 For more information on absentee voting, contact the County Election Board at 301 N. Main. The telephone number is 580-338-7644. The County Election Board’s fax number is 580-338-2618.